Home > News > Projection > Projection in day light? Impossible! Projection in day light? Impossible! It is a pretty well known fact that projection screens and daylight to not get along well. Natural light washes out the screen making the image very difficult to see, like shining a torch during the day. But what do you do then when your client has chosen a magnificent venue with skylights or large windows and the “natural day light” has been promoted as a feature for choosing the venue? If you have a sizable audience a high brightness LCD screen can range in price from £1000 -£5 000 each per day, a hefty price for some Power Point slides. The second option is a large LED screen which has also been known to blow budgets for mid sized events. So you are left with a projection option which can be an excellent, cost -effective solution when the right measures are taken to ensure the quality of the image. 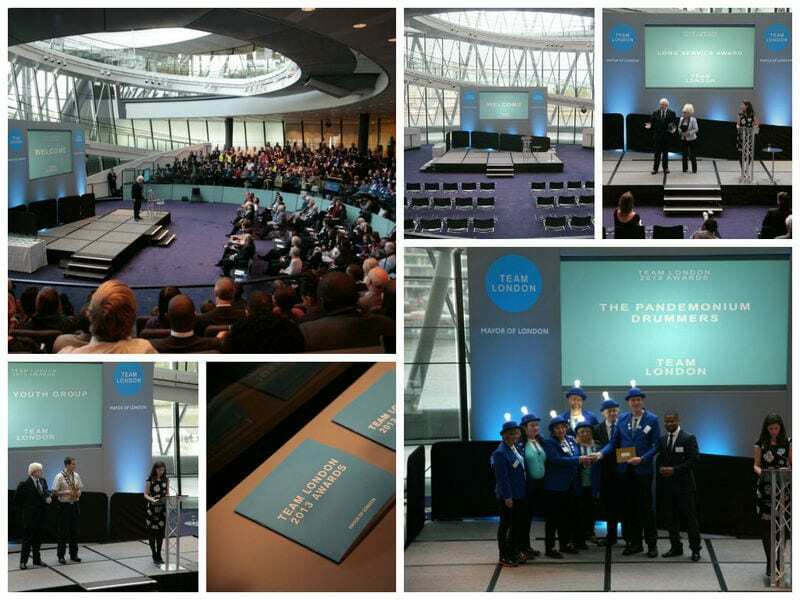 For the Team Awards given by the Mayor of London at the City Hall, we had the most beautiful sunny day in the Chamber. Well prepared, the set we had designed catered for a rear projection screen and our full HD powerful projector (with short-throw lens)which needed a 3m throw (the distance between screen and projector). What you and the audience can’t see in these images is the black -out surround we built bespoke to block any sun-light from interfering with the projection to the screen. This was the element that really enhanced the picture quality. Now we may have broken the magicians code by revealing this solution to projection in a room with a large windows. Our tips if you need to implement this is are ; make sure you have the space for rear projection and get the highest quality projector your budget can afford.